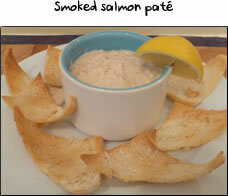 This starter is so easy, but the end result is so delicious. 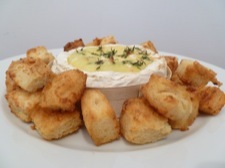 Crispy parmesan croutons dunked in melted camembert that's been infused with garlic & thyme. Pop the lot in the middle of your table and dive in. Just don't fight over who gets the last crouton! Before you start preheat your oven to 180c. Unwrap the camembert and put it back into the round box. 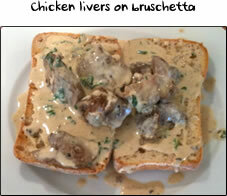 Have the garlic, thyme and cubes of bread ready. 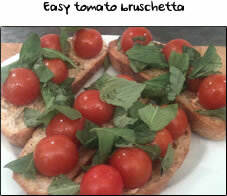 Pop a large pan on the hob (off the heat) and click here! Preheat your oven to 180c. Unwrap the camembert and put it back into the round box. Using a small sharp knife, make a shallow cut approx 1cm in from the edge all the way around. Carefully remove the lid, as per the first photo on the right. Next, make several holes in the camembert and stuff them with the thin slices of garlic and a few thyme leaves. Turn the hob onto a high heat for the frying pan/wok and add the knob of butter. 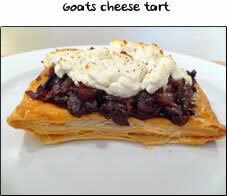 Place the camembert onto a baking tray and pop it into the oven for 15 minutes. By the time you put the cheese in the oven, the butter will have melted so add a teaspoon of oilive oil to the pan and throw in the cubes of bread. Give them a good stir to coat them with butter and cook for 1.5 minutes. Once they've started to go a nice golden brown colour, grate about a handful of parmesan cheese straight into the pan. Stir to coat the cubes in the parmesan and then remove from the heat. Put the croutons onto the baking tray alongside the camembert and cook until the cheese has been in the oven for a total of 15 minutes. To serve, put the lot in the middle of the table and tuck in!